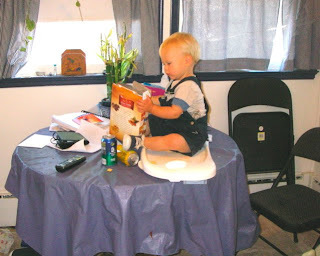 I walked into the kitchen the other day to behold this troubling sight: Desert Boy had clambered up on the kitchen table, sat squarely on his tray, and was about to dump a box of cereal on the floor. Yeehaw, what a good time (if you're Desert Boy!). As you can see, he doesn't pay any attention to me. So I need your help with a caption for this photo. What do you suggest? Over time we've looked at how some animal species have adapted to live in the desert with little water and hot temperatures. 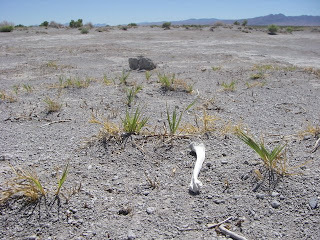 Well, some wildlife have just chosen to live where there is water and cooler temperatures, despite being in the desert. 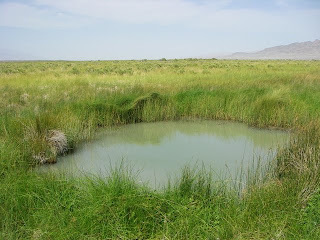 These spots are few and far between, but they do exist, like this spring out in the middle of a salt marsh. 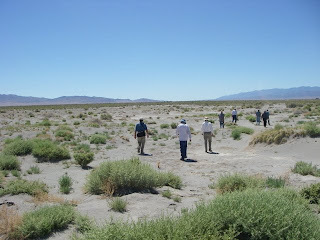 The surrounding soil is very salty, but the water temperature rarely rises above 15 degrees Celsius (about 60 degrees Fahrenheit). 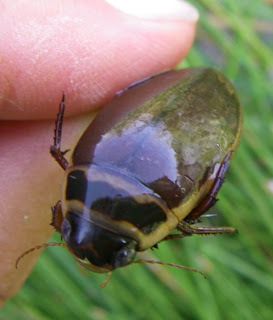 Here is one of the most common inhabitants, Dystiscus marginicollis, a predaceous diving beetle in the family Dytiscidae. As larvae, the long and skinny creatures are known as water tigers due to their predatory nature. As adults, they develop a hard exoskeleton and become oval shaped. They move through the water by using their legs as oars, moving their flattened hind legs in unison. They have a bubble of water stored under their wing covers to help them resurface, and they come to the surface tail first. As adults they can also fly around and find the perfect spring to live in. 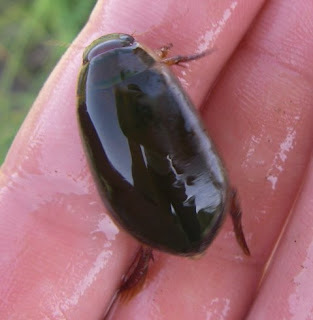 To me, just the name predaceous diving beetle sounds a little scary. And learning that they are cannibalistic adds to their creepiness. So it took me some time to work up the courage to pick up a beetle to examine more carefully. After all, I didn't want to become part of its prey, even if it was just a nibble. It has six legs, just like any insect, along with two eyes, antennae, and mandible parts. Those mandible parts are what scared me. They're short but sharp, and anything that's sharp can really get your attention. This particular species is widespread throughout North America. 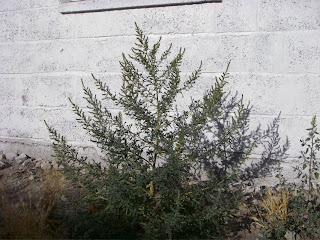 It has lots of close relatives; the family has about 475 species in North America. 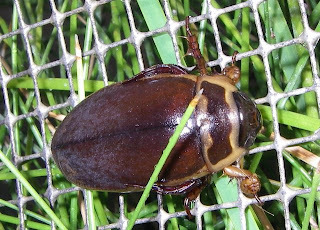 Apparently some species of these beetles are eaten fairly frequently in China, Thailand, and New Guinea, and are even raised for consumption. They reportedly taste like chicken. No, I'm kidding, the report I read said they taste rather bland. 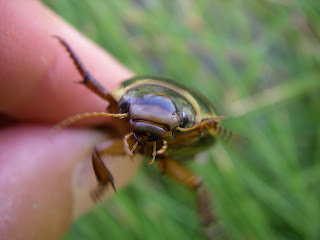 I have to admit that even though I sometimes do strange things, I did not taste this beetle for you. But if you want to taste one, let me know and we'll see if we can sort out something. 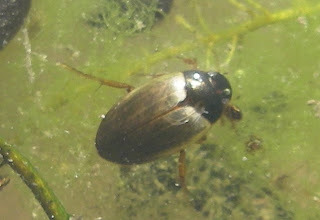 Closely related are the water scavenger beetles, in the family Hydrophilidae. Instead of using their legs like oars (both moving together), they use them like paddles (moving them alternately). Another difference is that when they come to the surface, they bring their head up first instead of their rear. 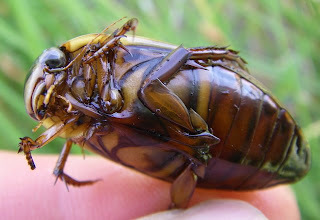 Both predaceous diving beetles and water scavenger beetles will also eat carrion. So don't fall into a spring and die or you really will become dinner. 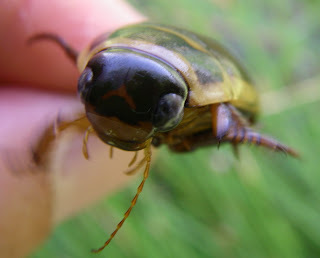 I'm working on a post about some cool beetles, but I realize that I need some more time to research them. So when I need something fast to post about, Desert Boy is always an easy solution. One of my brothers said I've posted way too many photos of happy Desert Boy, so today here are some other expressions. Like the one above, where you can see a tired and crying Desert Boy. 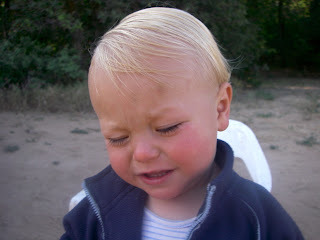 Maybe he's crying because he is so clean. Here's sleepy Desert Boy. The hike wore him out. 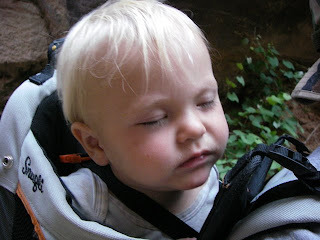 Wait a minute, he didn't have to do the hiking, why is he so tired? 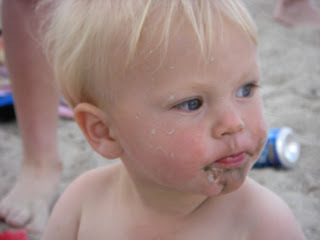 This is dirty and opinionated Desert Boy. He is not afraid to check out the scene and figure out what he wants. Take two: Dirty and opinionated Desert Boy. This is a look I'm seeing more often. His personality is definitely developing. Okay, I couldn't help myself, I had to put in one picture of a giggly, happy Desert Boy. It's just one picture, after all. 9/21/08 I've consulted with a herpetologist and this is indeed a Short Horned Lizard (Phrynosoma hernandesi) rather than a Desert Horned Lizard (Phrynosoma platyrhinos). Short horned lizards are rarer around here than desert horned lizards, and the principal way to tell them apart is by the shape and size of the little horns on the back of their heads. 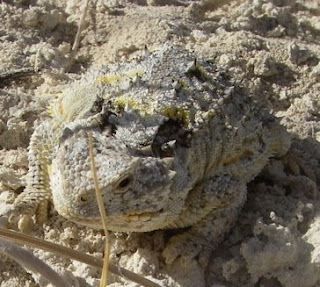 Both species have very similar life histories, so the information originally presented here for desert horned lizard still holds true for the short horned lizard. I was out wandering in the desert the other day and got lucky enough to come upon a desert horned lizard (Phrynosoma platyrhinos), my favorite lizard. My camera was handy so I snapped a ton of photos. Doesn't the lizard look like he (or is it a she?--I don't even know how to tell) is having a good time being a model? Look at the giant smile and the come-hither look of those dark eyes. 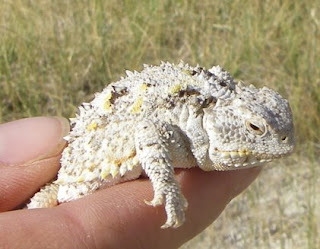 By the way, the desert horned lizard is sometimes called a horny toad, although it's not a toad at all. The name is kind of fun, though. I can see you smirking. 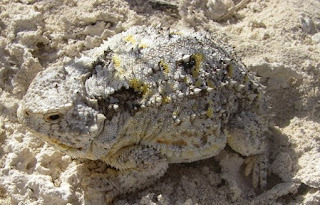 I was in a saline area, with lots of white salt and soil, and the desert horned lizard was white to match it. In another part of the valley with brown dirt, the horned lizards are browner. The black and yellow speckles look just like lichen, and if the lizard stayed still while you were walking, it would be virtually impossible to see it. However, desert lizards tend to try to run away to the nearest bush if someone approaches, making it possible to spot them. 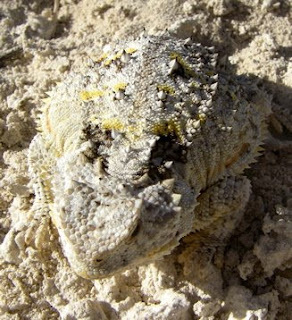 The two dark splotches on the neck are characteristic of the desert horned lizard. One of the cool things about this lizard is that it will partially bury itself in sand and wait for its favorite prey, ants, to walk by, and then stick its long tongue out and lift them off the ground and to its mouth and eat them. 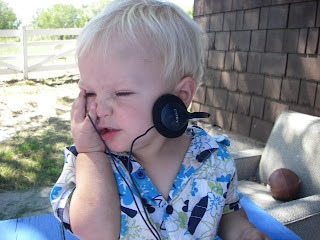 Sorry about using the word "cool" so much in this blog. I guess it kind of dates me. I would be a different generation if I used the word "awesome." And the kids today would say that this lizard is "sick." Now back to the lizard--again. Little baby lizards should be out and about now in August, hatching from eggs that were laid about two months ago. It will take a baby lizard about two years to become an adult, and they live about 5 to 8 years. Because they eat mostly ants and are picky about what ant species they eat, they don't do well in captivity. 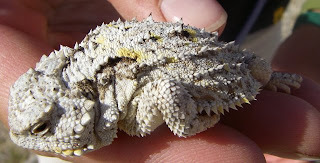 By the way, I almost forgot to point out the horns behind the eyes that give the desert horned lizard its name. But you probably already figured that out. As the weather gets cooler (which will occur at some point despite the heat wave we're in), the desert horned lizards will eventually go into hibernation for the winter. Then they'll come back out in the spring, ready to pose for pictures. We all know that water is scarce in the desert, after all that's what makes a desert a desert. So it's just smart to try and conserve water and use it wisely. The other day these three brilliant, up-and-coming contributors to our society found a wonderful way to conserve water. It was a simple idea--go swimming in the swimming pool without any water. The swim was great. It took no time at all to get the water to the right level--none. 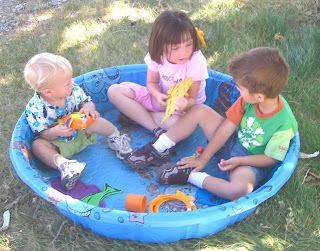 Throw in the pool toys, and they immediately began using their imaginations. They never argued about someone getting them wet accidentally and they didn't have any splash fights. They didn't get too cold, they didn't worry about their swimsuits not fitting properly, and they didn't get any water up their noses. When they finished their swim, they didn't need towels or a change of clothes. 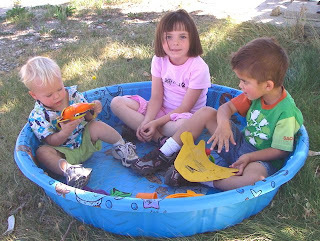 Their moms were pleasantly surprised by how simple it was for them to go for a swim. We can all learn from these three creative tykes. It will be interesting to see what they think of next. I love to go caving but haven't been underground lately. 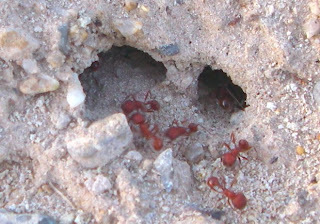 On one of my recent walks, I thought about the harvester ants going in and out of their mounds and realized that they are tiny little spelunkers. They don't even need a helmet or three sources of light or knee pads. And somehow they can adapt to being in the total darkness to coming out to bright, blinding sunlight without pausing at the entrance of their mound. 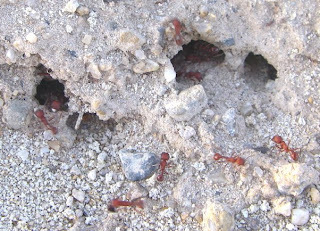 So in fascination, I stopped at one of the harvester ant mounds and watched these little guys for awhile. They move really fast, so I was happy when I got one closeup photo that looked fairly decent (see above), showing the tiny hairs on the ant's body. If you missed the earlier post about harvester ants, click here to learn some basics about these neat little insects and see some good photos of harvester ant mounds. 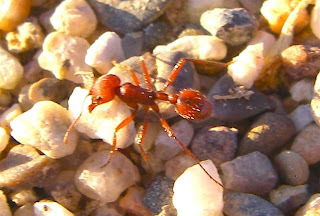 As I was peering intently at the mound, I saw a couple smaller ants with darker rears than the harvester ants nearby. I'm not sure if they were a different species or simply a different type of ant from the mound. (If you know, please share!) Both kinds are on the white rock. The entrance to this particular mound consisted of several small holes on the south-facing side. Since I've noticed that harvester ants always seem to prefer their openings on the south- or east-facing sides of the mounds, I've been examining every mound that I've found. So far I've only found one anomaly, with a north-facing opening. I'll keep an eye on it to see if that mound survives. Many times the ants went in and out of the holes several times before deciding which way to go. I'm not sure if they were confused or communicating or just playing. Somehow I doubt that ants play, they always seem so industrious. As I stood squatting with my eyes on the mound, I realized that a few ants were leaving the mound with bits of debris. It won't be all that long till the snow flies, so it's time for them to do some fall cleaning before they spend the winter underground. And I was so fascinated with the ants that I took this short video. The quality has been compressed, but I did find some fun music to put to it. 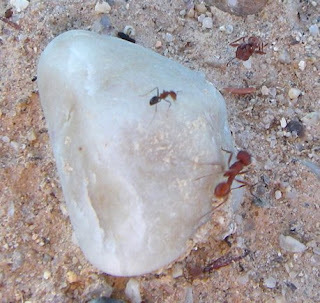 Look for the ant that's taking a little white something out of the hole, and later the two ants carrying a dead one. One of those two ants has to walk backwards! Over the weekend I had the opportunity to visit an old homestead, one so old that it's for the most part been forgotten. 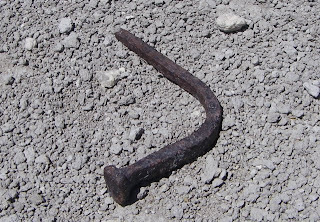 A few signs of it still remain, like this square nail. The site is not easy to find, but we had a guide. After driving a distance on a two-track road, we got out of the vehicle and started walking among some sandy knolls. The sun was bright, with not a cloud in the sky. It was a typical hot summer day. As we got further from the vehicle, the vegetation became sparser. Could this be right, was there really an old homestead out here? Who would want to live in such a desolate place when not that far away much more hospitable places could be found? Anxious to find out, and lagging behind due to all the pictures I was taking, I hurried to meet with the rest of the group and see what they were looking at. Sure enough, there was an old wooden log. Our guide explained that the area had once been substantially wetter. The homestead was close to a freighter route that was used to take supplies to the mines. 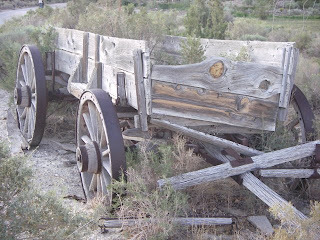 This obviously isn't one of the freighters, but it is an old wagon and helps me get in the mindset of how hard life was back then. My goodness, the wheels are made of wood! There's no suspension, much less comfortable seats, air conditioning, and a radio. Travel would have been a lot different than it is today. Here's another view of the wagon. 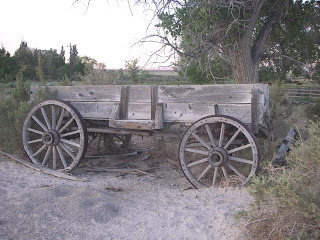 Can you imagine how dusty you would get sitting in it, behind horses that would be kicking up the dry dirt? And back in those days you might only have one outfit, so you wouldn't even be able to put on a clean outfit when you arrived at your destination. You'd just shake off the dust, and everyone smelled a little ripe so you wouldn't even notice--maybe. The definition of a shower was standing under a waterfall or a bucket, and a hot shower was probably beyond most people's comprehension. Some old barbed wire was nearby. I imagine that they used it to fence in stock animals. Back in the early days of the homesteads, in the late 1800s, there were very few fences up in the valley. Herds of sheep used the valley as winter range, and the sheepherders moved them all over, following the grass. A few more square nails and some old glass lie over on the side. 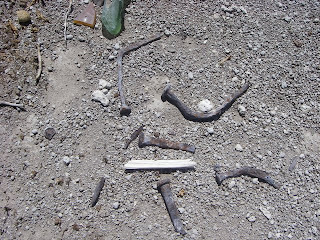 But beyond these few reminders of someone trying to scratch out a life in the harsh desert, we can't find anything. Our imaginations fill in the blanks as we think about how these hardy people survived. 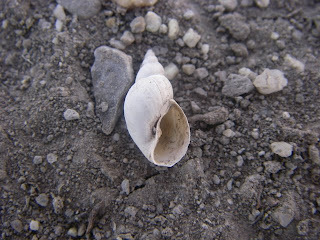 Not too far away are shells, indicating the increased water of the past made it possible not only for humans, but also for other creatures to survive. Living in the desert is not easy, especially when you don't have the conveniences of today, and more importantly, when you don't have water. 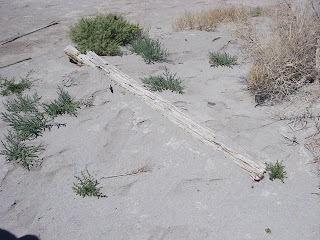 After the water dried up (probably due to nearby pumping for irrigation), the vegetation died off, and the wind carried off the fine particles of sand, leaving just the coarser material behind. 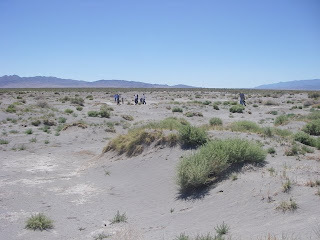 The site is called "the blow out" because of this, and on very windy days, the wind still blows dust from this area. It's such a change from the time when it appeared to be a good place to build a house and make a living. 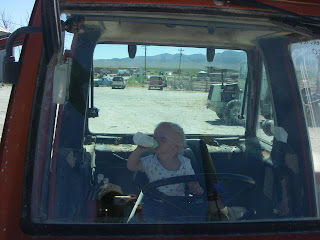 Desert Boy is back today with a public service announcement: Please Don't Drink and Drive. As you look at the above photo, you can see that drinking is consuming all his attention, and he is not even paying attention to what's in front of him. He doesn't even have his hands on the steering wheel, for goodness' sake! His face has a content expression as the liquid warms his belly and spreads throughout his body. He has become relaxed, not caring what else is going on around him. Then Desert Boy gets distracted by something behind him. Anyone or anything in front of him could be in grave danger. Trying to steer but looking in the wrong direction is an inherent danger while drinking and driving. He doesn't even seem to notice that he is performing a grievous mistake and continues chugging down the elixir. 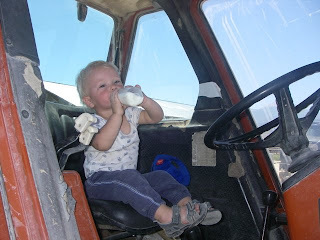 As he gulps out of his bottle, he has become a threat to society. So practice what Desert Boy preaches, not what he does. Obviously drinking and driving don't mix. How Do You Get These Clothes Clean? One thing I never thought about was how dirty ranchers get. Here's my dear husband after a normal day of work. 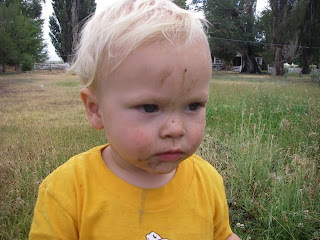 His boots are muddy, his jeans are filthy, his shirt has a big grease spot on it, and his face is dark with dirt. Usually as soon as he comes home in the evening he changes his clothes so he can play with Desert Boy. A couple times a week I wash these stained clothes. I've given up trying to get the stains out; they seem to be so meshed into the fabric that they will never leave. I guess that's what happens when you're under farm machinery trying to fix it and then walk through manure and later go check hay. I just ask him to make sure he doesn't mix up his good clothes and his work clothes. The stained clothes just keep getting more stained. Eventually they wear out and have to be replaced, and it's so strange seeing him go to work in a set of new work clothes. I know that in just one day they will be broken in, and his new work clothes will blend in with the rest. Yep, it's hard to believe, but summer is fast coming to an end. I'm seeing so many signs of that around me. 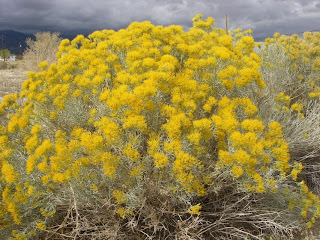 The rabbitbrush is blooming, putting out its beautiful yellow flowers. The are so pretty, but I find that I'm slightly allergic to them, so they stay outside. 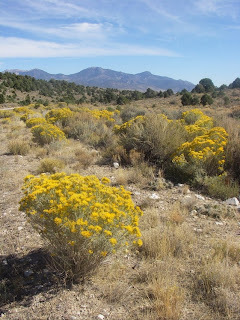 They're a happy looking flower, though, brightening the landscape when so many other flowers have lost their inflorescences and turned brown. 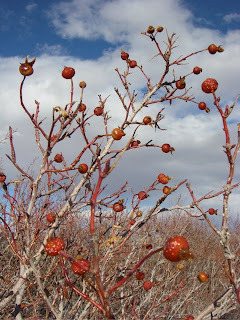 The rose hips on the rose bushes are bright and red. Supposedly you can make a tea from them, but I haven't tried that so far. I used to like roses until I came out here and had to bash my way through them to get to the creeks. They grow so thick that it's an adventure in getting scratched. I suppose that they beat poison ivy. 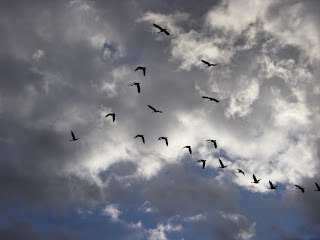 I'm hearing more and more geese as they stop by for some food and a rest as they travel south. They nearly always travel in flocks and their loud cries make me smile. The sandhill cranes seem to be flying around more now too, and my husband has called them pterodactyls so many times that now I seem to have adopted that name for them. Yikes. Many of the other birds have quieted down because they aren't looking for mates, so hearing these squawkers is refreshing. Little Desert Boy has developed an eye for spotting birds. 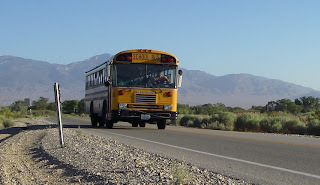 The yellow school bus is out and about early every morning and in the mid-afternoon, picking up and delivering the school kids. They are so excited to be back in school so they can see their friends, many of whom live far away. Aunt Tana drives one of the two buses for the community, spending several hours each day on the road to get to the faraway ranches and three schools. Here's one of the not-so-pleasant reminders of the end of summer: ragweed. It makes me sneeze like crazy. It's taken over the perimeter of my garden and the edges of the fields, so both my husband and I are in it daily and want to scratch our eyes out. One of the best things about the end of summer is the cooler temperatures, especially at night, making it the perfect time to go camping. 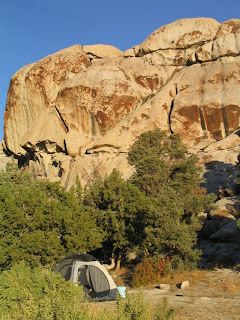 I'm still trying to convince my husband to go on a camping trip this fall. When we go camping, the most important thing is the food. We never skimp on the food. We eat more around a campfire in a day than we do in several days at home. Then we're so full we can't go hiking and just have to lay around and do nothing. That's my husband's ideal trip--eat and do nothing. He needs the rest after his busy schedule. I'm noticing other signs of fall too, like the calves being weaned and brought into the feedyard, the brown tinge to the landscape, and a little frost on plants at higher elevations early in the morning. Fall is such a beautiful season in the desert and I'm really looking forward to it. 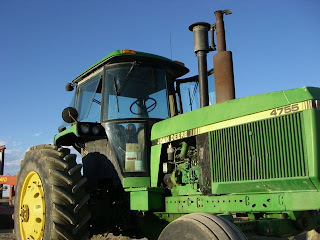 I recently needed to find something to make Desert Boy happy, so we went and visited some tractors on the ranch. 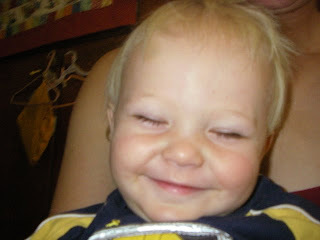 Like the first and second times we made these forays, he was absolutely beaming. 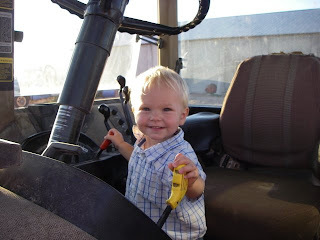 Desert Boy eagerly got up and started working the controls. 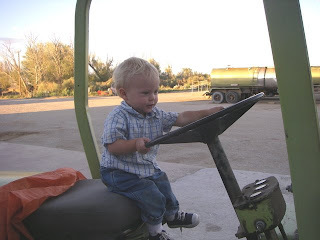 Except he's a bit on the short side at 31 inches, so he can't exactly sit on the seat and work all the levers. In the next vehicle he figured out a better way to drive, by standing on the seat. 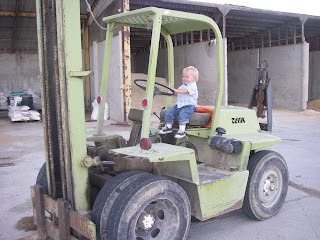 He may need to get leg extensions to work foot pedals, but it's okay with me if he doesn't drive for a few years. His attention span isn't too long. The vehicle he's in is a John Deere grader. Our ranch roads get washboardy quickly, so a couple times a year they're graded. 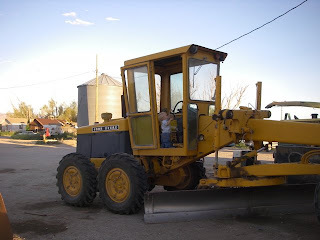 The grader is also used to help keep irrigation ditches clean. 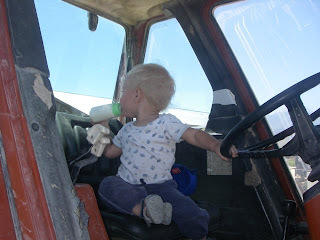 Desert Boy got tired of the grader and wandered over to a bright red tractor. 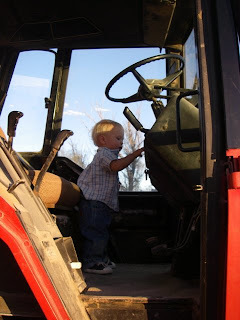 Once again he looks quite short in the cab, but he's alarmingly close to key level. 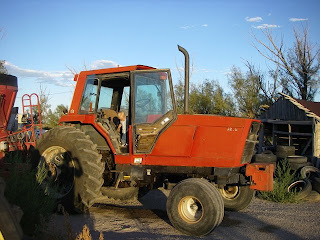 Here's a better view of the red tractor. It's towing the feed wagon. 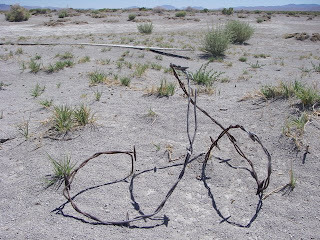 We move over to another part of the lower yard and find a piece of equipment closer to Desert Boy's size. 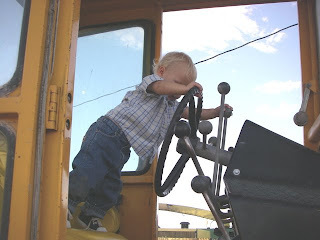 He can sit and steer. He is so happy. You can see the glee in his expression. He thinks he's really big stuff. Never mind that his jeans are too big and about to fall off and his shoe is untied. 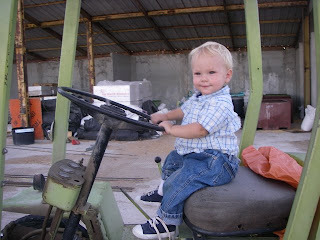 That's just not important when you're driving ranch equipment. So what's the piece of equipment his size? This fork lift. He is totally comfortable on it. 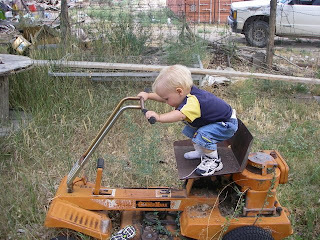 Despite all the neat machinery on the ranch, Desert Boy seems to be just as happy pretending he's driving this broken down lawn mower in our yard. It doesn't even have a steering wheel, but it has enough metal on it to seem like a real vehicle and warrant the full accompaniment of vroom, vroom noises.